It’s finally here! The dining room console table you have dreamed about for years! You bought your dining room table and chairs forever ago, but couldn’t afford to buy the table, chairs AND console table at the same time. So you waited and waited, looking and wanting…and then it happened! Your console table goes on sale!! Woo hoo! You manage to convince your husband that this piece is an essential item to your dining room and it’s barely functional without it…and somehow he reluctantly agrees to the purchase. The day has come…your side table is being delivered! It’s beautiful! Everything you dreamed it would be, it looks fantastic, has plenty of storage and fits perfectly in your room. BUT…now what? How do you style your new space? What are you going to place on top of your new table, or around the space? You run around the house looking for items to use on top. You try them out, they all look awful. You’re convinced you need to go out and buy a bunch of stuff to style your new space. Start with choosing a focal point for the space. I chose a large square mirror with similar tones to place above the table. Other options are pictures and art work. Next, design the space to add height to draw the eye upwards. This room has electrical outlets for sconces, so I am taking that route. But choosing the right sconces is going to be challenging. When styling our homes, it’s human nature to try to match everything. I’m guilty of this design faux pas as well. I chose sconces similar to the chandelier. While they are beautiful, they are too small for the space and a bit too matchy matchy. Another option, instead of adding sconces, is to add 2 tall lamps to the console table. If we didn’t have the sconces, the addition of the lamps would be perfect to add height to the space. But since we have sconces already on the wall, adding two lamps to the space is over powering and doesn’t look right. Sadly, we can’t have both. By removing the lamps from the table, and replacing the sconces with more appropriately sized but similar textured lights, we give the space better symmetry and style. Let’s set our console table for entertaining. The number one, must have styling element for any table – fresh flowers! Check out my post on painting everyday household items to give them a modern look (HERE). This vase was recently painted white. Adding candles is also a must have for your table. These painted candlesticks used to be black – check out post (HERE). The candlesticks add height and dimension to the table. Add in other textures like linen, glass and metal. Adding plate stands makes any dessert station more appealing. Adding several stands of differing heights and materials creates an attractive and inviting station. Layering is also important in creating a beautiful table. For more tips on layering, check out post (HERE). 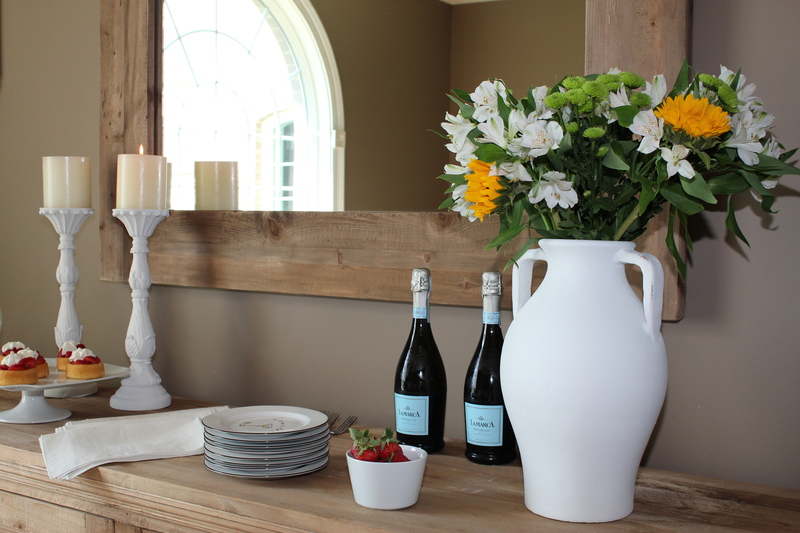 Lastly, try to add in color to your entertaining space with flowers, fruit, and even your bottles. Notice the blue labels on these Prosecco bottles, and the dessert plates have color on the rims. Food and drinks always taste better when shared with family and friends in an inviting space. For more tips on styling, check out post (HERE) for styling a coffee table. Like the coffered ceiling in this room, check out how to do it yourself (HERE) and check out the before pictures of the dining room before it’s remodel (HERE). Do you like the post, please share and remember to follow along on Instagram! See you next time. lovely design. Bless you, now that you have got your console table. The whole “affair” is complete haha. so beautiful, natural and simple. I love it! Keep it up! I love the colour combinations and you are a genius. Thanks Juli, you are too sweet.